Please follow the below instructions when fitting the THATCH-SAFE® product to your roof. One layer of THATCH-SAFE® to be laid, Aluminium side uppermost, over the rafters. To be secured by battens 50mm x 20mm at 250mm intervals. The battens are to be fixed by 3 inch galvanised nails to the rafters. All joins to be overlapped by 100mm and where are secured by an extra batten. Two Layers of THATCH-SAFE® to be laid around the chimney, the first layer to have the foil facing the chimney, the second to have the foil facing the thatch. The THATCH-SAFE® to be secured by battens 50mm x 20mm at the top and bottom. The maximum pitch of the battens to be no greater than 250mm intervals. 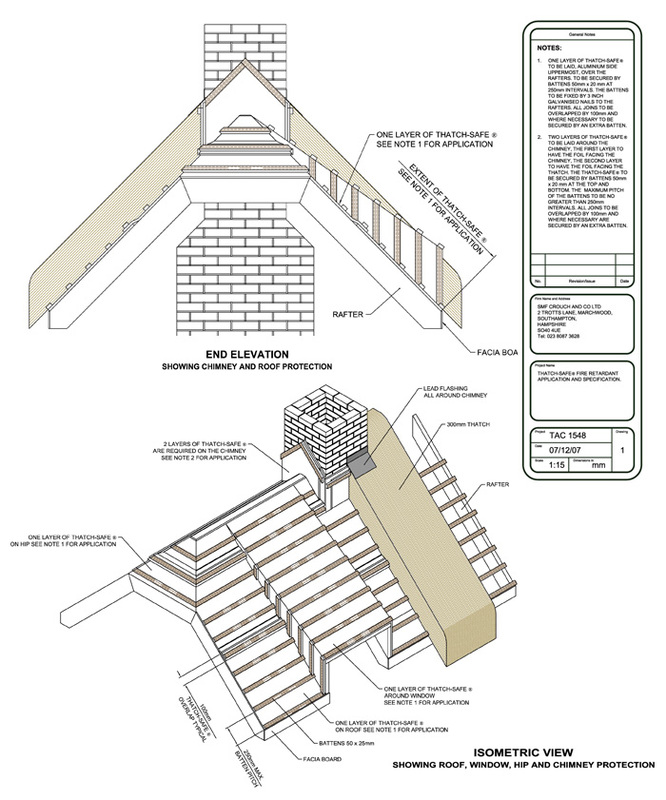 All joins are to be overlapped by 100mm and where necessary are secured by an extra batten.